This will be the start of an on going series of posts that will document the build journey in making a Shore Trooper helmet from the movie “Rogue One – A Star Wars Story”. I really liked the movie and this is my way of celebrating its success. If you are interested, I also wrote a review of Rogue One. Check it out here. Join me as I print, assemble and paint. I can pretty much guarantee that things will go wrong and hurdles will need to be overcome. 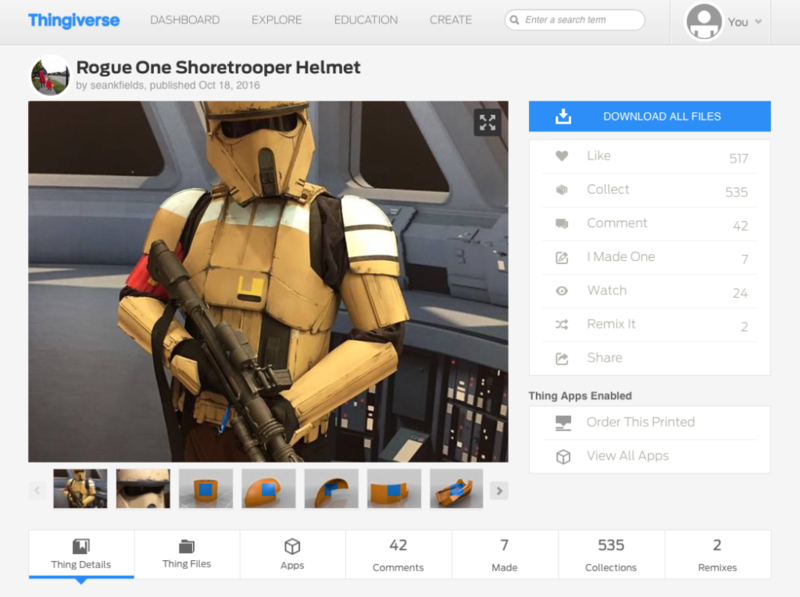 Through these posts, I hope to share and help others that may want to attempt to build their own Shore Trooper Helmet. Sometimes all it takes to inspire someone is to see that it is possible. Though I have done other projects before, this will be the first major print and build. It should be an interesting challenge, and I’m excited to see the final outcome. So without further ado lets begin. First let me describe my setup. I live in a small apartment, so I don’t really have much room for a workshop though I’d love one. So when considering tools and equipment, it needs to be compact and storable. Back when I was researching a printer, it needed to meet these criteria. In the end, after balancing all these considerations, I went with an Ultimaker 2Go. The printer is small, yet the build plate is a good usable size. The print quality is on par with its larger siblings. But with that said, I do regret not going for the large version, the reason for that will have to wait for another day. I’ll write a “1 year on” review of the UM2Go, so if you are interested, please do subscribe and be notified when that goes up. The printer is in its stock form, so no special settings or changes there. In terms of filament, I am using what is readily available in my area. 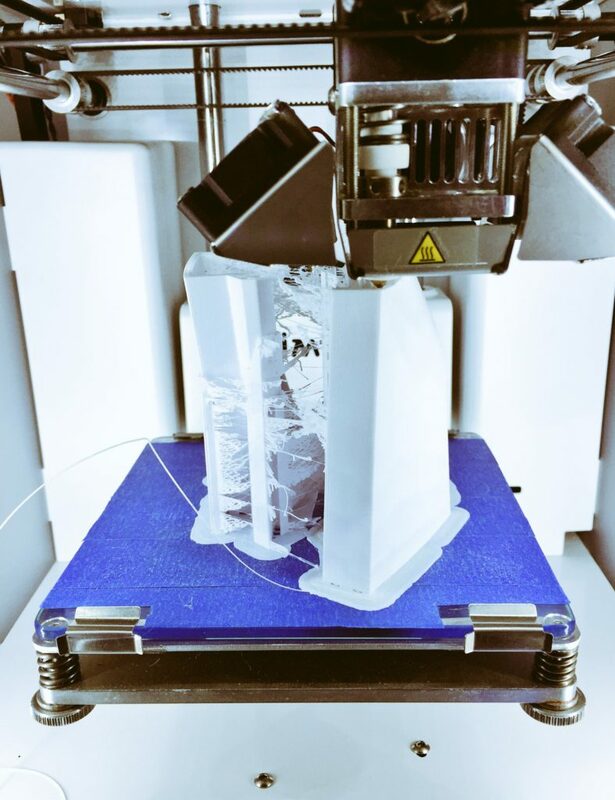 I am printing in Esun Cold White PLA+. My experience with Esun has been a bit of a hit and miss. I have used both the regular PLA and PLA+. I have been able to get fairly decent prints from both but I have all had my fair share of failures. Different colors also seem to produce different results. So far my best experiences have been with Cold White, so that is my goto color. It is available here for around US $23 for a spool of 1KG. A similar spool of OEM Ultimaker PLA will run around US $45 for only a 0.75KG. Even though the OEM PLA has produced the best results, it was a matter of economics that I went with the cheaper Esun. One thing I discovered and have yet to completely solve is the tendency for Esun PLA to feeder grind. My solution so far has been to turn off retractions for my prints. 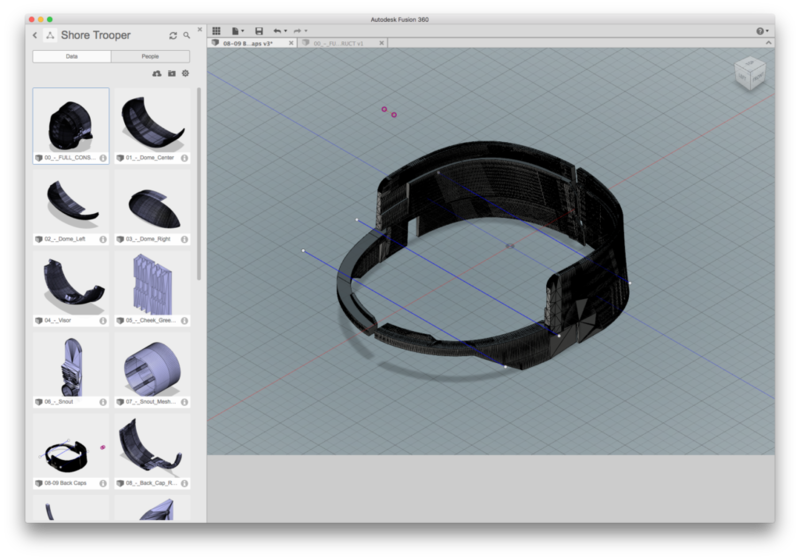 Though I have some familiarity with Fusion 360, I am no where close to capable modeler. So naturally I default to others with much more talent in this area. Thingiverse is one of the best repositories for me. The file is exceptional and many thanks to Sean and all the people who share their work. 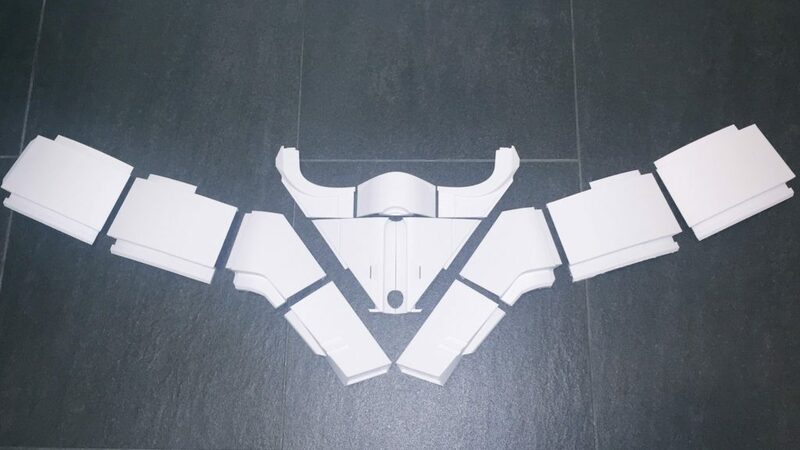 The helmet is designed in pieces. This is to allow for easier printing on the Makerbot that the designer has. In my case, the build platform of the UM2Go is much smaller. So this required me to further slice the model so that I could fit it on my build platform. This is a fairly easy process. Just a few sketch lines in Fusion 360. If I was to go back and do it again, I would probably put “keys” in rather than straight slices. This will help a lot in aligning pieces for assembly. 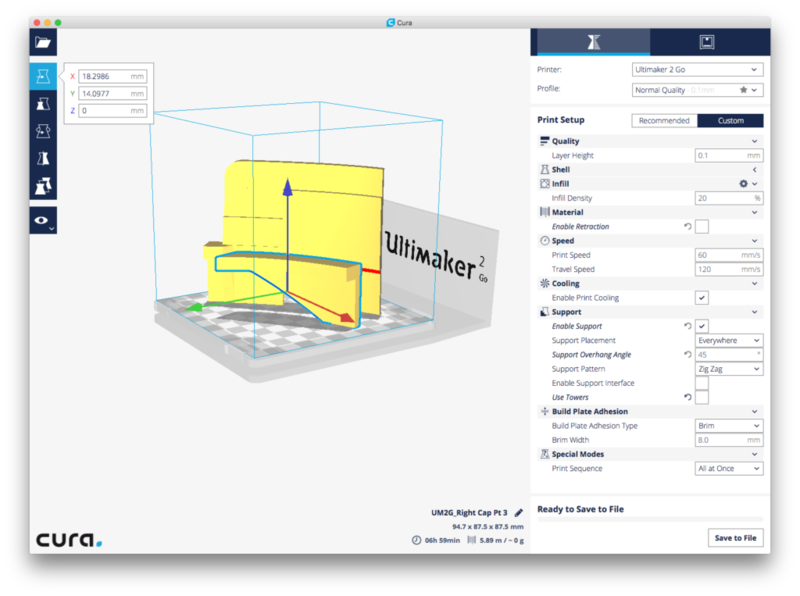 I use Cura as my default slicer for the UM2GO. It has its faults but, all in all is a decent straight forward slicer that works well with the Ultimaker. I am sure there are better slicers out there with much more customizable options, but for my current level of expertise, Cura is adequate. 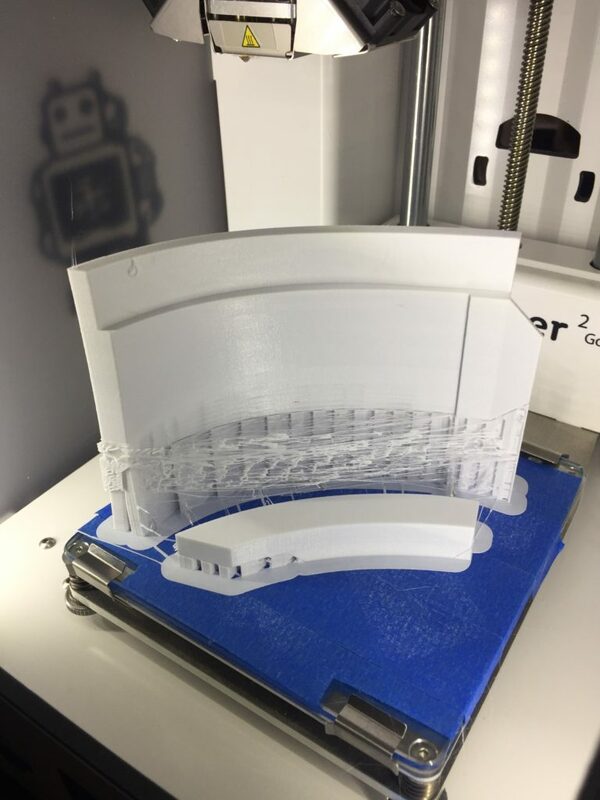 The challenge is to orient items on the build platform for the best possible prints. In my case, I would flip items upside down to ensure that the final print surfaces are smooth. This is especially needed if they are to be seen from the outside. I’m lazy and want to avoid major putty jobs if I can. With the size of the pieces, I was only able to fit one piece at a time. Only in rare cases was I able to fit another smaller item. Once all the items were ready and saved to Gcode. All that was left to do was press print. On average, at my chosen settings and object sizes, the print times range from 4-8 hours. I usually set a print for overnight and another for in the morning. This allows me to complete 2 prints a day at most. The going is slow but, it gets the job done. As of this post, I still have a few more pieces to print out before all is complete. One of my favorite things about 3d printing is watching an item being built layer by layer. Somehow it is a mesmerizing process. Second to that is waking up and seeing that a 8 hour print has completed properly. The euphoria is greater the longer the print time. So as I watch each piece slowing materialize, I am already thinking about how the next one will be. So after a week of printing, albeit not non-stop, I have amassed a growing collection of parts that are itching to move onto the next phase of this project. Now as the printer still continues to chug away, I am looking forward to assembling everything. Stay tuned for the next post where I begin the prep and assembling of the build. If you’re curious about 3D printing and don’t have your own printer or just want to test out my printer, I’ll be picking and printing out a reader submitted model each month and sending it off at no cost. Check out my post for more info.